In the last few years as the real estate market has become tougher there has been a flurry of 'creativity' among some real estate companies in how they package their services. One such offering is the "MLS only" listing where, in exchange for $500, a real estate agency offers to place your property in MLS (agent's multi-list service...basically, a website). One might think, "Great, I get the exposure that the MLS might bring me without having to pay a 6% commission." The problem with this scheme is the MLS itself. The MLS is the agent's playground and it costs 3 to 6%+ to play there. A property may get on MLS for $500 but that isn't the final cost to sell. It's the 3 to 6%+! Another problem is that due to local MLS regulations the owner's contact info may not be listed in the ad, only the listing agent's...the person who took your $500. In this instance, the only way a buyer (or their agent) can contact the owner is to first contact the agent. Chances are that if the house is shown, the buyer's agent will expect at least a 3% commission from the buyer or the seller. So the homeowner has essentially paid $500 for the obligation to later pay a 3%+ commission. But again, why would any agent show one of these discount properties for less money when others are available? Agent's offer to list a home, not for the standard 6% commission, but for a 'flat-fee.' For example, an agency might offer to list a $200,000 home for $4000. The issue here is that the $4000 is usually only a part of the total commission that the seller may pay. When a buyer's agent makes an offer on that property they will expect their 3% commission. So now you're up to 3+% + $4000. There is a long, colorful and documented history of the battles between discount VS full-fee agents. There real issue here is the question of whether buyer's agents would be so inclined to direct their clients to 'flat-fee' listings. Such listings might be on MLS but they are clearly identified and ignored. The Federal Trade Commission has had to deal with this 'blackballing' or boycotting behavior of discount broker listings by competing full-fee agents. (Residential Real Estate Brokerage Industry, Paul Roark (Federal Trade Commission) and Butters Report 1988). If this is a battle you want to get involved in, go ahead. Take home message: There really is nothing new under the sun with respect to how real estate is bought and sold as long as any scheme the agent's devise involves their MLS. There are two clear and pure options: Sell it through a full-fee agency, get what they offer with the biggest fee you will ever pay. Or, sell it on your own, maintain control and save a fortune in headache and treasure. What is a lockbox? Agents put them on doorknobs...how do they work? Well, if you list your home with an agent they will most likely want to put the key to your front door outside your home in a lock box. A lockbox is a gizmo that attaches to your front door knob that is basically a locked box with the key to your door inside. The idea is that since all the agents have the key to that box all they have to do is open it up get your key and show the property. What a great idea! Until you realize that not only does every agent in the region have access to your home anytime but that everyone who has access to that agent has access to your home as well. Spouses, boyfriends, girlfriends, relatives, friends...anyone who has access to a realtor has access to your home. Why is a lock box combined with access by multitudes of unknown people such a bad idea? Other than the obvious security concerns, there is the very real threat of a home intrusion while you are at work. Because legitimate agents do come and go from homes, an imposter agent (a rogue agent or someone with access to the lockbox) going into a home would be unnoticed. Legitimate agents and imposters are hidden in plain sight because neighbors can't tell them apart. Compared to a burgler in a ski mask someone with the code to the lock box is invisible. Hence the great risk both day and night. Do want to even worry about the possibility of someone coming into your home at night when your family is sleeping, or while you're away on a business trip. Security systems provide no security if a lock box overrides thoses defenses. Think it doesn't happen here? Think again! What is a 'rogue' agent? As an example see the attached photo from the Valley News a few years back. 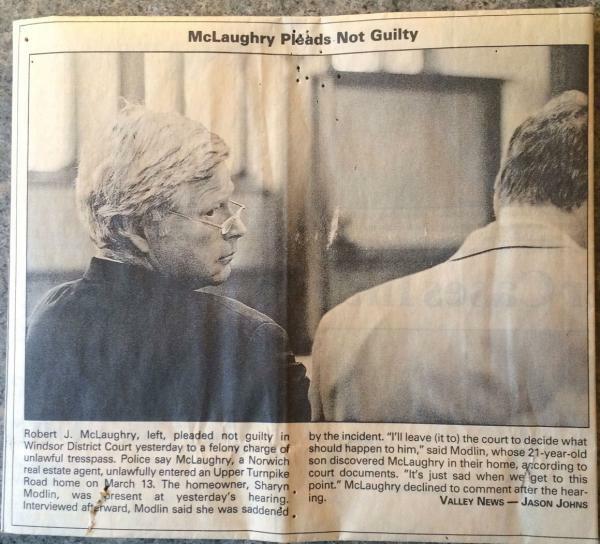 This realtor, Robert McLaughry, a principal of Lang, McLaughry & Spera Real Estate Company or whatever they've changed their name to again, was caught red-handed going through the medicine cabinet of a listed home (presumably looking for something he needed). Clearly a tragic case involving an unfortunate individual with a substance abuse issue who also happened to be a realtor. This is precisely the issue, how many others with access to lock boxes, are similarly affected? Who knows? Is it worth the risk to your family, your privacy to have a lock box? You decide. Maintain your privacy and safety, sell by PRIVATE sale through Picket Fence Preview. You will know who was in your home because you will show it. No more wondering who was there that day, if any one was there that day? Why do things seem 'moved'...out of order...not as you let them? Use your imagination, you get the idea. It's under deposit to a couple from Washington State - all cash! Then I got another offer from a New Jersey couple for $20,000 more! But since I already agreed to the earlier couple I went with that. I'm glad I didn't waste time with a realtor.